The elegant sauvage leather watch band in fine full grain Italian cowhide with a two-tone effect is a luxurious classic. The two-tone look is achieved through double dying. During the first step the leather is dyed in a light color, then the skin is rolled up and dyed again in a darker color. The skin-friendly lining leather ensures exquisite comfort; the matt look and hand-sewn stitching guarantee a low key, luxurious look. The pure aniline dyed sauvage leather watch band complies with the European REACH directive. Roobaya watch bands have adapters and buckles to match the color of the watch case. The high quality manufacture guarantees durability and maximum comfort. This Roobaya watch band makes the Apple Watch your new favorite accessory for any occasion. Precision fit: All Roobaya Apple Watch bands are available for Apple Watches 38 and 42 mm. Exclusive: The high quality packaging also makes the watch band the perfect gift - for business partners, friends or yourself. 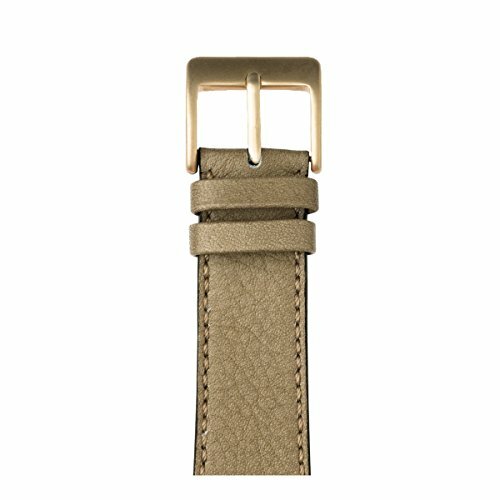 Stylish: Roobaya Apple Watch bands are available in a wide range of colors, materials and styles to make the Apple Watch (practically) unique. If you have any questions about this product by Roobaya, contact us by completing and submitting the form below. If you are looking for a specif part number, please include it with your message.